Proprietary Name: Moxifloxacin Ophthalmic Solution What is the Proprietary Name? Non-Proprietary Name: Moxifloxacin Ophthalmic Solution What is the Non-Proprietary Name? Moxifloxacin Ophthalmic Solution with NDC 62332-505 is a a human prescription drug product labeled by Alembic Pharmaceuticals Inc.. The generic name of Moxifloxacin Ophthalmic Solution is moxifloxacin ophthalmic solution. The product's dosage form is solution/ drops and is administered via ophthalmic form. FDA Application Number: ANDA209469 What is the FDA Application Number? Moxifloxacin ophthalmic solution USP is indicated for the treatment of bacterial conjunctivitis caused by susceptible strains of the following organisms:Corynebacterium species* Micrococcus luteus* Staphylococcus aureus Staphylococcus epidermidis Staphylococcus haemolyticus Staphylococcus hominis Staphylococcus warneri* Streptococcus pneumoniae Streptococcus viridans group Acinetobacter lwoffii* Haemophilus influenzae Haemophilus parainfluenzae* Chlamydia trachomatis*Efficacy for this organism was studied in fewer than 10 infections. 5 mL bottle filled with 3 mL sterile ophthalmic solution of Moxifloxacin hydrochloride, 0.5% as base. Moxifloxacin ophthalmic solution USP is contraindicated in patients with a history of hypersensitivity to Moxifloxacin, to other quinolones, or to any of the components in this medication. NOT FOR INJECTION. Moxifloxacin ophthalmic solution USP is for topical ophthalmic use only and should not be injected subconjunctivally or introduced directly into the anterior chamber of the eye. Because clinical trials are conducted under widely varying conditions, adverse reaction rates observed in the clinical trials of a drug cannot be directly compared to the rates in the clinical trials of another drug and may not reflect the rates observed in practice. The most frequently reported ocular adverse events were conjunctivitis, decreased visual acuity, dry eye, keratitis, ocular discomfort, ocular hyperemia, ocular pain, ocular pruritus, subconjunctival hemorrhage, and tearing. These events occurred in approximately 1-6% of patients. Nonocular adverse events reported at a rate of 1-4% were fever, increased cough, infection, otitis media, pharyngitis, rash, and rhinitis. Drug-drug interaction studies have not been conducted with Moxifloxacin ophthalmic solution USP. In vitro studies indicate that moxifloxacin does not inhibit CYP3A4, CYP2D6, CYP2C9, CYP2C19, or CYP1A2, indicating that moxifloxacin is unlikely to alter the pharmacokinetics of drugs metabolized by these cytochrome P450 isozymes. Pregnancy Category C. Teratogenic Effects: Moxifloxacin was not teratogenic when administered to pregnant rats during organogenesis at oral doses as high as 500 mg/kg/day (approximately 21,700 times the highest recommended total daily human ophthalmic dose); however, decreased fetal body weights and slightly delayed fetal skeletal development were observed. There was no evidence of teratogenicity when pregnant Cynomolgus monkeys were given oral doses as high as 100 mg/kg/day (approximately 4,300 times the highest recommended total daily human ophthalmic dose). An increased incidence of smaller fetuses was observed at 100 mg/kg/day. Since there are no adequate and well-controlled studies in pregnant women, Moxifloxacin ophthalmic solution USP should be used during pregnancy only if the potential benefit justifies the potential risk to the fetus. Moxifloxacin has not been measured in human milk, although it can be presumed to be excreted in human milk. Caution should be exercised when Moxifloxacin ophthalmic solution USP is administered to a nursing mother. The safety and effectiveness of Moxifloxacin ophthalmic solution USP 0.5% have been established in all ages. Use of Moxifloxacin ophthalmic solution USP is supported by evidence from adequate and well controlled studies of Moxifloxacin ophthalmic solution USP in adults, children, and neonates [see Clinical Studies (14)].There is no evidence that the ophthalmic administration of Moxifloxacin ophthalmic solution USP has any effect on weight bearing joints, even though oral administration of some quinolones has been shown to cause arthropathy in immature animals. Moxifloxacin ophthalmic solution USP 0.5% is a sterile solution for topical ophthalmic use. Moxifloxacin hydrochloride is an 8-methoxy fluoroquinolone anti-infective, with a diazabicyclononyl ring at the C7 position. Chemical Name: 1-Cyclopropyl-6-fluoro-1,4-dihydro-8-methoxy-7-[(4aS,7aS)-octahydro-6H-pyrrolol[3,4­ b]pyridin-6-yl]-4-oxo-3-quinolinecarboxylic acid, monohydrochloride. Moxifloxacin hydrochloride is a slightly yellow to yellow crystalline powder. 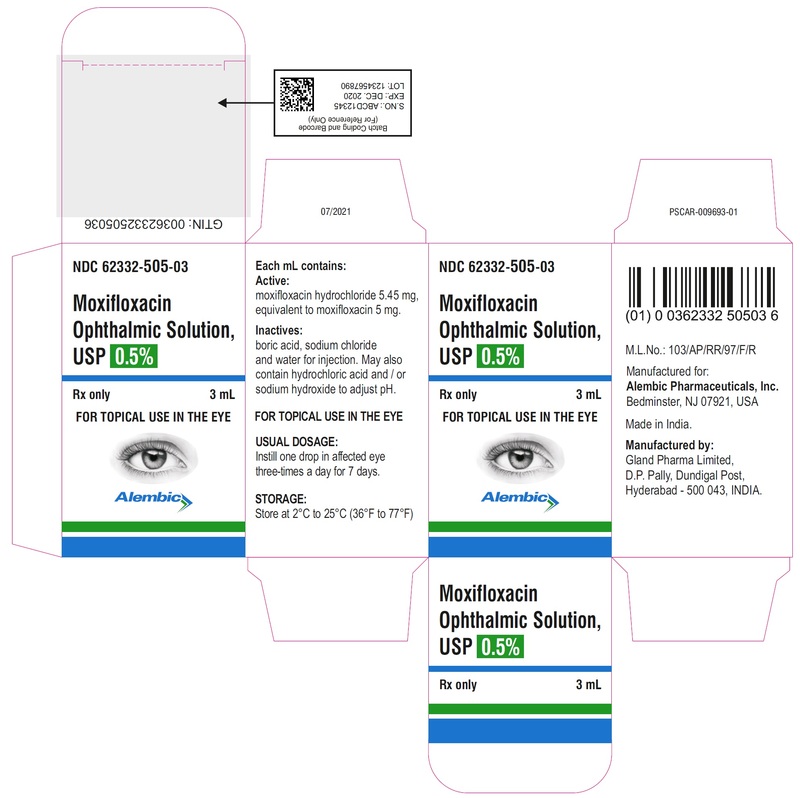 Each mL of Moxifloxacin ophthalmic solution USP contains 5.45 mg moxifloxacin hydrochloride, equivalent to 5 mg moxifloxacin base.Contains: Active: Moxifloxacin 0.5% (5 mg/mL); Inactives: Boric acid, sodium chloride, and purified water. May also contain hydrochloric acid/sodium hydroxide to adjust pH to approximately 6.8. Moxifloxacin ophthalmic solution USP is an isotonic solution with an osmolality of approximately 290 mOsm/kg. Moxifloxacin is a member of the fluoroquinolone class of anti-infective drugs (See 12.4 Microbiology). Plasma concentrations of moxifloxacin were measured in healthy adult male and female subjects who received bilateral topical ocular doses of Moxifloxacin ophthalmic solution USP 3 times a day. The mean steady-state Cmax (2.7 ng/mL) and estimated daily exposure AUC (45 ng●hr/mL) values were 1,600 and 1,000 times lower than the mean Cmax and AUC reported after therapeutic 400 mg doses of moxifloxacin. The plasma half-life of moxifloxacin was estimated to be 13 hours. Long-term studies in animals to determine the carcinogenic potential of moxifloxacin have not been performed. However, in an accelerated study with initiators and promoters, moxifloxacin was not carcinogenic in rats following up to 38 weeks of oral dosing at 500 mg/kg/day (approximately 21,700 times the highest recommended total daily human ophthalmic dose for a 50 kg person, on a mg/kg basis). Moxifloxacin was not mutagenic in four bacterial strains used in the Ames Salmonella reversion assay. As with other quinolones, the positive response observed with moxifloxacin in strain TA 102 using the same assay may be due to the inhibition of DNA gyrase. Moxifloxacin was not mutagenic in the CHO/HGPRT mammalian cell gene mutation assay. An equivocal result was obtained in the same assay when v79 cells were used. Moxifloxacin was clastogenic in the v79 chromosome aberration assay, but it did not induce unscheduled DNA synthesis in cultured rat hepatocytes. There was no evidence of genotoxicity in vivo in a micronucleus test or a dominant lethal test in mice. Moxifloxacin had no effect on fertility in male and female rats at oral doses as high as 500 mg/kg/day, approximately 21,700 times the highest recommended total daily human ophthalmic dose. At 500 mg/kg orally there were slight effects on sperm morphology (head-tail separation) in male rats and on the estrous cycle in female rats. In two randomized, double-masked, multicenter, controlled clinical trials in which patients were dosed 3 times a day for 4 days, Moxifloxacin ophthalmic solution USP produced clinical cures on day 5-6 in 66% to 69% of patients treated for bacterial conjunctivitis. Microbiological success rates for the eradication of baseline pathogens ranged from 84% to 94%.In a randomized, double-masked, multicenter, parallel-group clinical trial of pediatric patients with bacterial conjunctivitis between birth and 31 days of age, patients were dosed with Moxifloxacin ophthalmic solution USP or another anti-infective agent. Clinical outcomes for the trial demonstrated a clinical cure rate of 80% at Day 9 and a microbiological eradication success rate of 92% at Day 9. Please note that microbiologic eradication does not always correlate with clinical outcome in anti-infective trials. Moxifloxacin ophthalmic solution USP is supplied as a sterile ophthalmic solution in dispensing system consisting of a natural low density polyethylene bottle and dispensing plug and tan polypropylene closure. Tamper evidence is provided with a shrink band around the closure and neck area of the package.3 mL in a 5 mL bottle - NDC 62332-505-03 Storage: Store at 2˚C to 25˚C (36˚F to 77˚F).